Action from Teversal, who staged a fine fightback against Ingles. 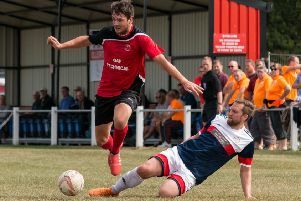 A controversial, late penalty sabotaged an excellent fightback by Teversal away to Shepshed side Ingles in the Premier Division of the East Midlands Counties League. Teversal had recovered from 2-0 down in the first ten minutes to level at 2-2 and looked set for at least a much-needed point towards the foot of the table. But on 79 minutes, a spot-kick was given when referee Mehul Karia, on the advice of an assistant, decided that when a cross by home substitute Josh Bowley struck Jake Payling on the arm, it was deliberate handball. Laithan Hammond duly fired the penalty into the roof of the net to give Ingles a 3-2 win. Striker Hammond had also opened the scoring before picking out an unmarked Sean Woolley for the second goal. But Teversal responded strongly and pulled one back by the break when a fierce shot by Aaron Williamson struck Matt Wilkinson to wrongfoot the ‘keeper. The visitors domimated the second half and levelled on 72 when Wilkinson provided an assured finish from a pass by Luke Walker.